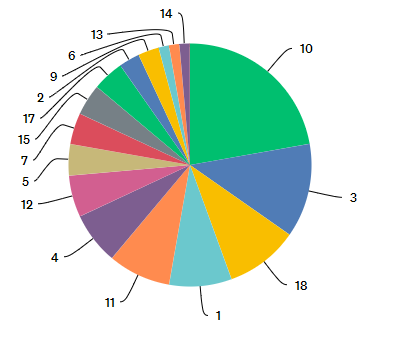 Least Favorite hole is Hole 3 (18%), trailed closely by hole 2 (15%) and hole 15 (12%). 85% of surveys said they play OB when they play casual, and 81% say that the OB adds to the competitiveness of the course. Our Tag monthly the most well attended event we offered. 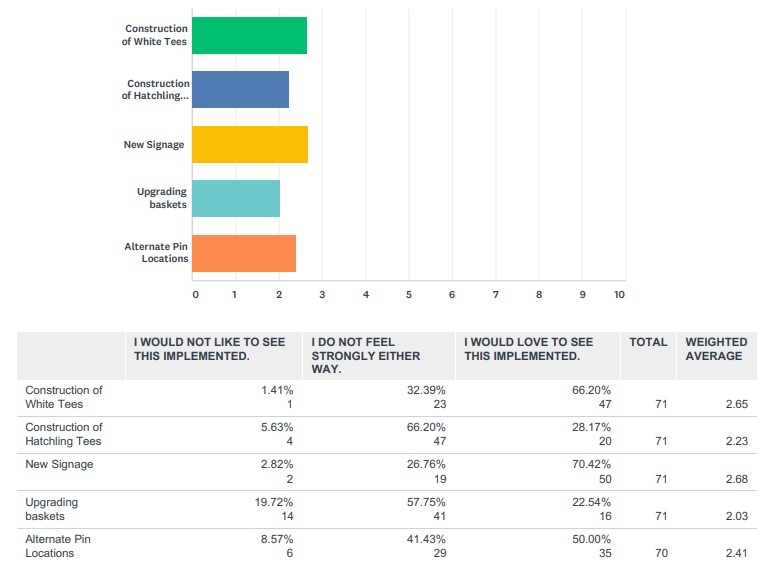 The projects that seemed to be of the highest importance to the community was new signage (70% felt strongly), White Tee construction (60% felt strongly), and alternative pin locations was 50% strongly desired. Hatchling tees and different baskets were both decidedly meh. Admin Team weighted at 4.83 out of 5.0. Hole 3 was voted the least favorite hole, but was also the second favorite hole. We attribute this to a number of factors. Not all respondents may have played the new pin location. The hole redesign is still in its infancy. Some of the responses we got about it were that “it is a nearly impossible 2” which lends itself to the old position and truthfully, is why we made that change. Hole 3 in the short position is a tweener hole- as a par 3 you will RARELY see it birdied, but if you make it a par 4 it becomes an easy 3. We moved the pin back to make it into a true par 4. From it becoming the second favorite hole, it seems as though conceptually people were in favor of this new location. Heard, loud and clear. We will continue to thin that area to make the approach a bit more accessible without making it a cupcake. To those who commented to put the pin back? We see you, too! The joy of alternate pin locations is we can freely move the pins back and forth. As we continue to put in alternative basket locations, we will be shuffling the layouts. Last year hole 2 was widely voted on the hole that needed the most work. We addressed that last year by adding the left lane to offer an alternative route to the pin. Further, we had thinned the large clump in the middle of 3 trees. One of this years questions was if the hole was playing more fair. With a weighted average of 3.89, it seems like the hole still needs some work. We do not feel as though it needs a massive amount of additional clearing, but we have identified a few additional strategic trees we will thin out to continue to make the hole less spray and pray. The out of bounds has been for the most part universally accepted as making the course play more competitively. The OB is great. Just keep it clearly marked. Change is good, so change in difficulty is good. generally pretty fair and makes sense. However, hole 7 repeatedly came up as an area needing to be addressed. I think the OB on 7 goes way too far into the fairway making it significantly more difficult to play. The only dacey ob I don’t agree with is the ob on 7 which is exactly where the majority rhbh players and those who have the distance can easily go ob by kicking back into it. I love the OB with the exception of hole 7. That middle portion is cancerous… otherwise everything else seems fair. Still difficult on 7, even to lay up and avoid it. Lot of drives that look safe off to the right funnel down into the OB. It’s like a black hole for those of us that don’t have the arms to consistently hit the initial tight gap and have it carry over a huge OB pit in the middle of the fairway. Only one I’m not a huge fan of is the little blind part of 7 that juts out. Let me explain a little bit about what is going on with hole 7. As some of you know, Dacey is built winding through protected wetlands. This is particularly hamstringing to course design on the front 9. The left side of 7, and left side of 8 specifically are low areas of the course and are particularly close to those wetlands. The OB was designed to keep players OUT of those areas- we want deter people from stomping around, breaking down branches to clear a better throwing zone, or messing up the ground to get better footing. Unfortunately, that jutted out area on 7 seems to be a low area where the wetland is encroaching upon the course. Does it make the hole play harder? Most certainly. Was that the only reason we added that OB? No. There was a practical reason behind it. Blind OB area in the middle. Safe shots can roll OB. No real safe lay up zone. We have internally discussed a way to address this to satisfy both the wetland and the players desires. Jeremiah Libby already chopped up an existing downed tree to buffer the OB line so discs will not roll in there. Further, this might also act as a dam effect to keep the water from further creeping up into the fairway. Secondly, we are planning on thinning the small brush on the right hand side of the fairway to extend that fairway about 20ish feet right, and we are going to thin the path area leading up to 8 to provide players with a wider angle and a bail out zone as well as a wider area in Circle 2. This will provide a safe 3 play, as well as the more aggressive 2 run carrying the OB. We plan to thin the area by 8s path only to a point, allowing for the teebox and early part of the fairway some continued shielding from hole 7. This should provide a more playable shot for all levels, while still giving bigger more aggressive arms a chance at separation. The water around [Hole 9s] tee is out of control. Needs some way to move water away from the tee area. keep the putting green dry on 18. Moar stones. Can we ask for stone from the town? The main path needs to be continued after where they put the stone past 6’s basket(main trail). No muddy walk to 7. The stone ends on the path and everything turns to mud. The efforts for the mud reductions, adding wood chips/drainage are fantastic. Would love to see more. Yeah. It’s a PROBLEM. Again, Dacey is built on wetlands. However, we are looking into ways to alleviate some of that issue. Hole 1’s green is an absolute mess. As the ground continues to soften, we are going to look into making some drainage ditches down into the river. Even with the wood chips last year, we ran into significant issues with that. Hole 18s green is currently a mess, as has been a mess for some years. A few years back when the town brought some equipment back they used hole 18s green to turn their trucks around in during the mud season. It tore up the green and it never really recovered and has gotten progressively worse. A possible thing that we may investigate is putting a temp basket out in the opening, pulling the usual basket for a couple weeks and completely reseed the area. It should get enough sunlight to grow, and if we can stay off of it and let the roots take hold it might help with that green significantly. I will be speaking to the town about getting more stone and/or more wood chips. The road down behind 6 to 7 is a disaster. We are going to look to get more stone, and we are also going to construct a footbridge on the more direct walk to 7. We started that project but did not fully finish it. Hole 9 will be a much tougher task. With the slope of the land, the only place hole 9 would drain to is hole 8. We are thinking about cutting up the big downed tree into stepping stumps that are higher than what we have now for the time being as we continue to think about ways to better fix that. This has come up both on the survey, and in casual conversation. The foot bridges are about as old as the course is, and the have shifted, sunk, and broke apart as the ground has shifted and foot traffic has increased. The foot bridge to hole 1 is a high priority fix, and the bridge from 15-16 is essentially useless. We are going to be looking to repair those in the near future. Hole 1s bridge over the water is its own thing. Beautifully built and aesthetically pleasing it is, but practical it isn’t. Something we will likely be dealing with for the duration. What we can do is make it a bit safer. We had put down grip strips but those did not last the winter. A possible solution we are looking at it bolting the grip strips in, or putting in studs like the bridges at flat rock to improve traction on it. As many of you know, and some of you have unfortunately experienced (myself included) coming down that bridge in snow is blow out central. Chuck Edman already posted about this. He would love to see you guys there, but no more “I will be there in 5 minutes” texts. Be punctual if you want to play. We did this two years ago, it quietly faded away last year. This is the first we’ve really heard about it since. Seemed to be a lot of work for a precious little attention being paid to it. Meet in the middle and track monthly? Sunday’s had a lot said about competitive balance. There should be pools for sunday league so each random pair has one a pooler and 1 b pooler. Using a spreadsheet to determine prizes and tags for the weekly league and monthly’s rather than doing it all by hand would save everyone a lot of time. This is a difficult thing to balance. Unlike regular league- there needs to be an even number of A and B poolers available for this to work. With random dubs, you can get 7 A poolers and 3 b poolers and a c pooler. It is a delicate balance there that is not always practicable to split. That said, we’ve been talking about trying to schedule some sort of regular pro/am byop type event. Having seen Devens’ digital registration and what not I can’t give it the highest ranking. Tag matches often result in standing around an hour or so afterwards. I wish there was a way to better address this. We can definitely improve here. We are looking at instead of “head to your hole and start” at league we will have a set start time to yell through the course. Often times the admin card is the last to tee as we are putting away the table, putting things back in the bin, locking up, and then heading down to our hole. By the time our card tees, some groups are already throwing their second hole. Hopefully a shotgun type start will help some of that down time. Of our bigger projects, we asked you to rate how you would order them in terms of what you want to see. Signage was a massive surprise for us. Perhaps we took for granted our personal knowledge of the course- I am very glad we included this option as it is overwhelmingly desired! Dean Slowey has already begun working on new temporary signs to show the new lines and is going through and replacing all the dilapidated ones. We are going to work on not just hole signs, but also directional signage. Particularly on hole 3 to hole 4, and hole 17-18. White tees…that is something I personally have been pushing for a number of years. We actually got verbal confirmation from the town that they would be going out and building them for us in October. However with the amount of rain we got, there was “too much mud” for the equipment to get back there. We will likely be on our own for this project going forward. We have almost all the material we need in stock from the town, with the notable exception of half our rubber tee mats due to the vendor being flakey. Last year, we posted about adding multiple baskets per hole, as that was the initial plan for the course. This was something we felt was not in the best interest of the course, as many hole did not justify having two baskets in the ground at once like Borderland does. That said, the initial course vision was to have two baskets per hole. We still feel as though that is excessive. HOWEVER- multiple anchors in the ground is another story. The ability to have alternative locations is something that half of the community reported that they would love to see. We are investigating doing alternate basket locations on a number of holes. With a concrete plan already in place for hole 17, and some abstract ideas for other holes that we will be toying with. The model I am striving for is like the Hill at Devens. Due to these impending changes- the new tee signs will be in the same vein as the former ones, as investing in nice permanent signs at this point seems a bit silly. Hatchling tees were a pet project of mine. These short tees were designed for the Kids Disc Golf event, but also served to satisfy a town desire to make the course more family friendly. Going back to the second basket idea that was initially in the plan…it was specifically geared towards a family friendly layout. Rather than waste space and finances on an expensive and largely useless competitive layout, we looked at the Hatchling to be something that would be more accessible to the Franklin Community without hindering the Disc Golf Communities experience. The general consensus is that this is nothing that we really feel strongly about. For one event during the year, I am not going to be prioritizing making them any more official than a few flags in the ground and a laminated sign. The Hatchling tees will remain there for play for anyone interested, but will not have anything additional invested into them at this time. We had an open ended question at the end for anything we didn’t ask to give you guys the floor to tell us some things we might have not mentioned. I’d like to highlight and comment on some of those. I think it would benefits anyone new to the sport if the admins finds ways to provide more workshops on improving skills, host more Clinic events with Pros if possible. Certainly! Greg Dowdell is currently offering classes through the Franklin Park and Rec office for Disc Golf. I have a Prodigy Par2 and Air Show in the works that would provide a little Q+A with local Prodigy Sponsored Pros on the horizon. We can certainly offer more of that. The past few years we have seen Philo Brathwaite, Will Schusterick, and Drew Gibson come out during the MVP Open. I am currently working on bringing a tandem of touring pros this year- preferably a male and female. I have reached out to Garrett Gurthie and Jessica Weese, and Eric and Tina Oakley have been floated to me as well. I feel pretty strongly about getting an FPO player out here to help promote the female side of the game! How in the world can we increase the number of women playing DG? With all the local TC teams – there are plenty of women interested. If we started a women’s league – would there be interest? Participation? I know many women don’t necessarily feel comfortable “playing with the guys”, so a women’s league would be great – maybe it can travel from course to course – Dacey, Borderlands, Pyramids, Hawkins? As I mentioned above I’d love to get a current FPO tour player to come out- I think that would be hugely beneficial to the local ladies, and would probably draw some of the ladies from surrounding courses as well. We would love to see more women on league night, and would happy to host a traveling womens league should one arise. If you are interested in taking this on, or adding Dacey to an existing women’s league circuit- please reach out to us! Plenty of people talk about wanting to be more involved in helping out. When you are holding Work Days or events where you need extra hands, it would be great to get more than a few days notice. We have a lot we’re hoping to do out there…we would like to schedule some more work days to get some help. We will need it. Especially for white tees. That’s going to take some man power. First of all- big shout out to you all for using the trash cans. We have a relatively clean course…aside from trash barrels overflowing. With nicer weather ahead, trash runs are more frequent. We emptied them all on 3/28. Doing trash is the crappiest job we do, and whomever volunteered to help is a saint! If you want to help us out without getting stinky…crush your cans before throwing them in the bins. When doing trash we noticed just how much wasted space in the barrels there are from empty cans. They will not fill as fast if we are all stomping our cans down before pitching them! You do not have to tell me twice! Lemurs have some issues with lactose. I know things. This, on a broader scale. Just because we haven’t specifically spoken to your feedback in this post does not mean we didn’t see it! We know there are plenty of other stuff that could be worked on. Most of what was talked about here is on a much larger scale. Thank you all for taking part in the survey! We appreciate your time, dedication, and effort to help direct us in making Dacey ever better! Again, not everything you ask for we can provide, but we can do our best to continue to improve the playability of the course and keep driving us forward. Can’t stop, won’t stop. Let’s get after it! Here’s to a great 2019 season! -Alex and the Admin Team!